Tracey Moffatt’s photographic practice is firmly entrenched within the narrative and stylistic lexicon of television, film and media culture. Much of her work is based on recollections of media images from ‘a whole 1960s childhood and 1970s adolescence [spent] glued to the television or with my nose in a book’.1 She typically uses photography to raid the image banks of popular culture and personal memory, recasting familiar visual codes with an acutely critical edge. For example, her well-known 1989 series, ‘Something more’, draws on the imagery of B-grade films of the 1950s and the racy covers of schlock novels of the 1960s; while ‘Scarred for life’ 1994, references the photojournalism and photo essays of ‘Life’ magazine. Signed and dated l.r.corner sheet "Tracey Moffatt `97". Judy Annear, Look: 1953-2003 celebrating 50 years , 'Art through a lens" photography and the Art Gallery Society', pg.48-50, Sydney, May 2003, 49. Judy Annear, Look , 'Contempo supports Photography Collection', pg. 24, Heidelberg, Mar 1998, 24. 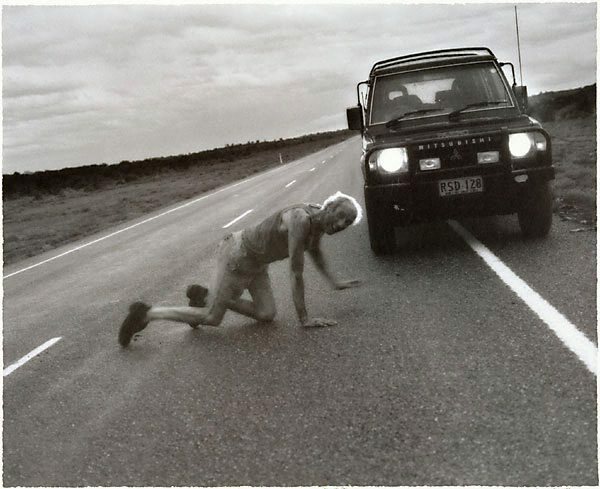 Bronwyn Clark-Coolee, Photography: Art Gallery of New South Wales Collection , 'Time - memory - people', pg.246-265, Sydney, 2007, 252, 262. Adrian Martin, Artlink: The big pond, Australian artists overseas , 'Tracey Moffatt's lost highway', pg. 14-15, South Australia, Dec 1998. Jane Somerville, Look , 'Where to now, Contempo? ', pg.28-31, Sydney, Jul 2007, 30. Strange Days , 'Tracey Moffatt', pg. 18-25, Sydney, 1998, 18-25. Photography and Australia , 'Localism and internationalism', pg.110-133, London, 2007, 129. Tracey Moffatt , Paris, 1999, (colour illus. ).